version11 » The Qlik Board! I recently moved a client’s dev/test environment onto a new server. 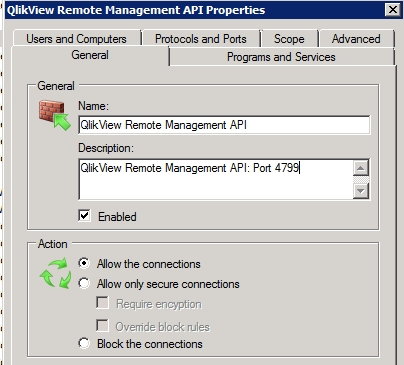 There were a few dozen reload tasks and rather than recreate them by hand, I chose to use the Import Task feature via the QMS Remote Management service. The process is fairly straightforward and intuitive. Below are the steps I followed. (This is on QlikView 11.2 SR6, by the way. Windows 2008 R2 Enterprise OS.) In my environment there was the remote server — let’s call it the OLD server, and the target server — we’ll call it the NEW server. And I had previously stopped all QV services on the OLD server and set them to Manual. On the NEW server, all the preparation is done within the QMC, in the System > Setup tab. I’m going to walk through the steps as if you want to import ALL tasks (as opposed to selecting specific tasks for import). Go to the Source Folders tab and you should see a list of folders From the OLD server. For each of these, map them to a folder on your NEW server. Click Apply. Go to the QlikView Servers tab and map the name of the OLD server to the NEW server. In my case, because I had done some name-switching, these were the same name, but the mapping is still required. Apply. Now that the link is established, the task import is quite simple. You’ll be presented with a new window with an expandable tree of your source folders. Click the top-level to select all tasks and click OK. You will be prompted to confirm. I had read that the triggers of the type: “On event from another task” would not be created unless all tasks are imported. However, even though I did indeed import all tasks, none of the triggers were preserved. This was not the end of the world, but certainly eroded the value of the import. <– Wrong! See “IMPORTANT EDIT” below . So…it turns out that the triggers (including the “One event from another task” triggers) were indeed created on the import. But because I had triggers disabled, the “links” did not appear. Once I started selectively enabling triggers, the Tasks screen showed the serial task chains as I expected. Highlighting Redux – Alternate States to the Rescue! The year was 2010 … Katy Perry and Lady Gaga topped the charts. Gas was $4.00 a gallon. A beer in Los Angeles cost five bucks. And dynamic highlighting of dimensional values in QlikView charts (a.k.a. brushing) needed a data island. AND I did a post on this topic: Highlighting a “special” dimension in bar charts. Fast forward to Summer 2013 … okay, not much has really changed in the bigger picture but WOW is it easier to do brushing in QlikView. Actually, this is not really a new technique because I’m going to employ alternate state to do this trick which has been around since version 11 first came out. What’s wrong with the old method? Recall the challenge with brushing is that we want to provide users the ability to dynamically focus on one dimension value (i.e. make a selection), but we don’t want the other dimension values to vanish. Prior to version 11, this could be accomplished by using a data island (i.e. a stand-alone table that does not associate to the rest of the data model) that will provide a dimension for the users to make selections. And this dimension is necessarily decoupled from the model because it is an island. This approach works fine, but it’s cumbersome to have to create an island table for every dimension that may be used for brushing. How can we simplify that step….. It just got easier – Altered States! If we think for a moment how the old method worked – that is, we decoupled the brushed dimension from the chart … which we did via the data island. Alternate states is another way to decouple data entities, and the good news is that we do NOT need to build additional tables to do it. 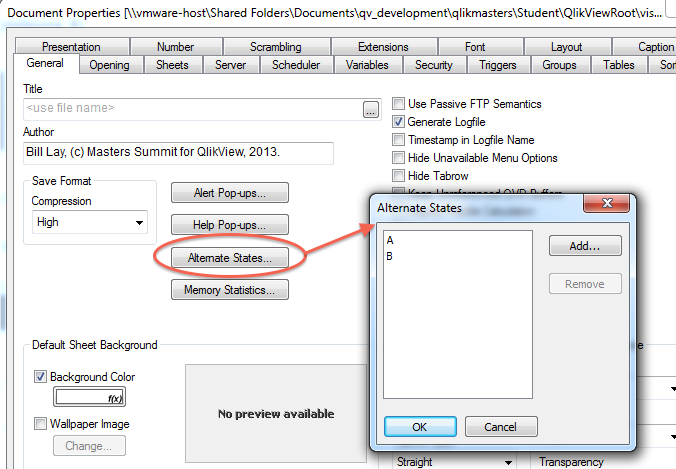 The really, really easy step … go to the Document Properties and click on Alternate States to bring up the dialog box. Add a state and call it A. (Note: I also have a state called B in the image). 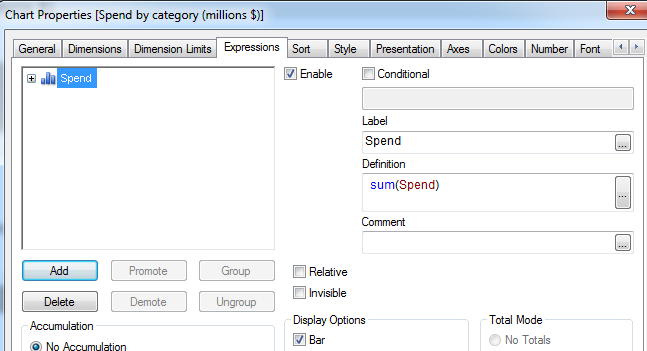 Create a list box on the chart dimension – [Category Desc] in our case. Be sure to assign the state to A in the General tab of the list box properties. Be sure that the chart is in the inherited state; i.e. the Default state (not the A state). The chart itself is quite simple with a single dimension: [Category Desc]. The bar color can be grossly controlled by the setting on the Colors tab in the chart properties. But we can also finely control the color; i.e. 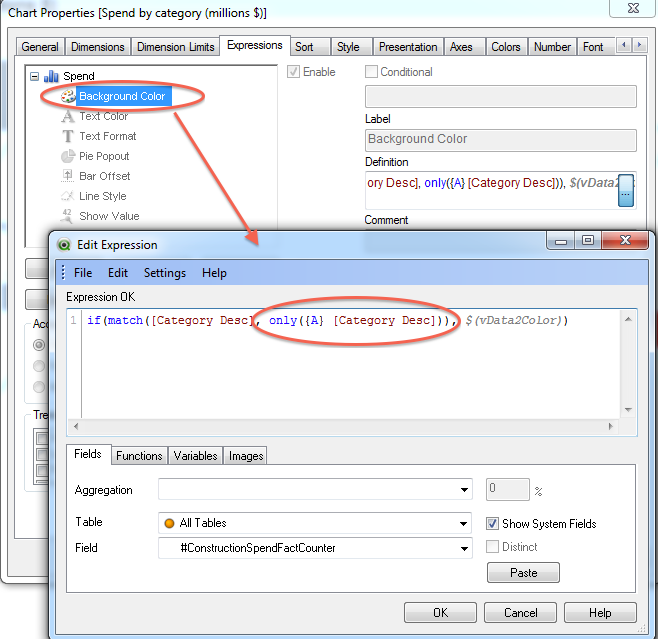 by using a data-driven expression by expanding the expression (on the Expressions tab of properties) and manipulating the Background Color. Notice that invoking the alternate state is as simple as putting the state’s name A in the set definition. The final result is a chart that in which any of the bars can be dynamically “brushed” by the users. 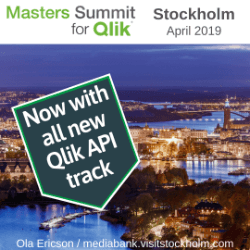 More of this at Masters Summit – Europe! This is one of the topics I’ll be covering in my Visualizations course at the Master Summit in Europe in October. Rob, Oleg, Barry and I will be sharing our techniques with students from the UK and Spain – hope you can join us! Do you use OnOpen triggers in your application? Isn’t it a pain to have close and then re-open the app to test them? I accidentally happened across a very cool technique to simulate the re-opening, and thus re-triggering of the actions. It’s as simple as toggling the WebMode.